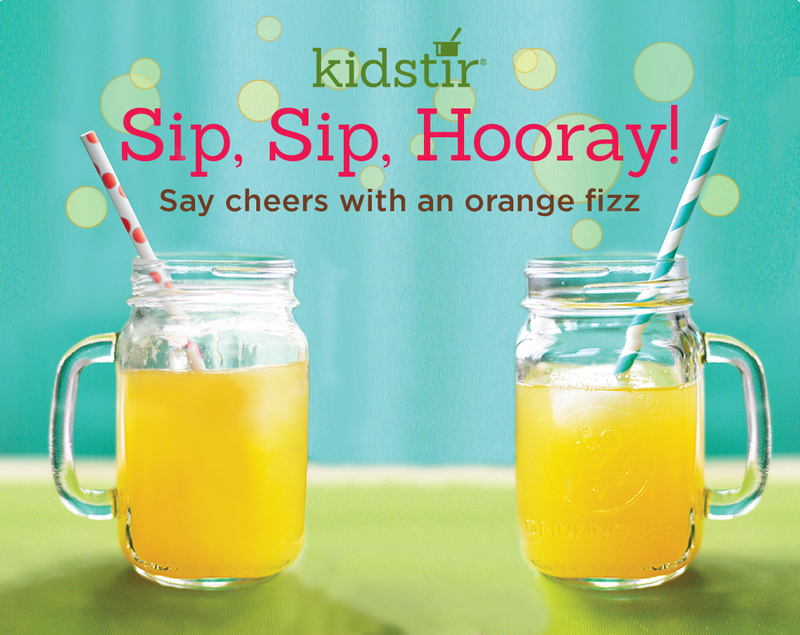 Say cheers with this simple, homemade orange soda. Serve it up in tall glasses and sip with the Silly 'Staches and Smiles. 1. Start by making the Simple Syrup (the sweetener for your orange fizz). A grown-up can heat 1 cup of sugar and 1 cup of water in a saucepan. Bring it to a boil and stir. When the sugar has dissolved, remove it from the heat and set aside. 2. Grate one of the oranges to make zest. Zest comes from the orange part of the rind—not the white part! Measure out 1 tablespoon. 3. A grown-up should cut all the oranges in half. Kids can use the juicer to squeeze the juice from the oranges. Twist back and forth—and squeeze! 4. Pour the orange juice into a measuring cup. It should measure about 1 cup of juice. Add the orange zest. Let it sit for 5 minutes. 5. Pour the orange juice through a strainer set on top of a pitcher. This will remove the zest, pulp, and seeds. Add 2 cups of sparkling water and stir well. 6. Taste the orange fizz. What do you think? If it's too tart, stir in 4 to 6 tablespoons of Simple Syrup from Step 1 into the pitcher. Pour into glasses. Say cheers!